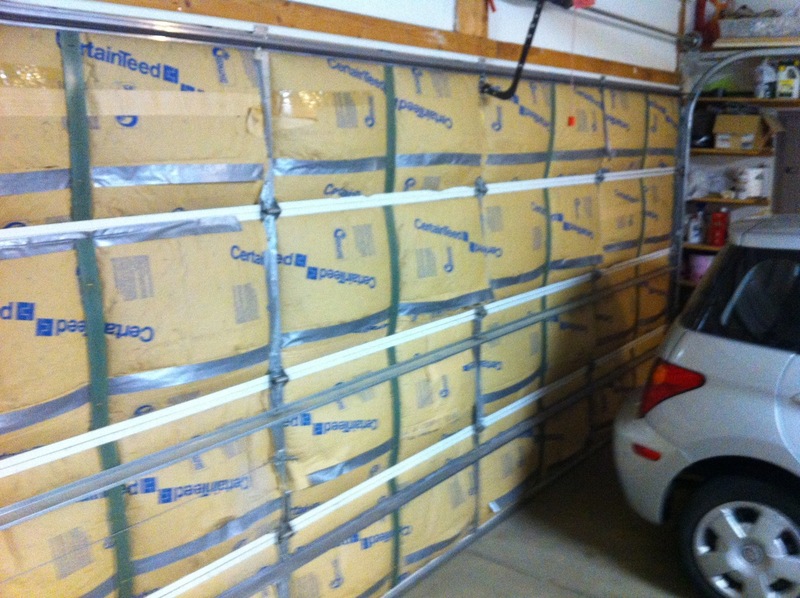 A $40 insulation job on the garage door of my previous house saved hundreds of dollars of fuel. And made the garage a much more pleasant place to work. We’ve all read the tips in the newspapers about how to reduce our heating bill. Turn down your thermostat and get a programmable one. Seal your air leaks. Add insulation to your attic. Blah blah blah. It’s boring, but it’s powerful advice, because US households spend an average of about $960 each per year keeping themselves warm. That’s three months of grocery money for a family, pumping heat into a leaky sieve that could actually have been built to require much less, or even no added heat, depending on the location and climate. So while the USA Today-style heating articles are good enough for those readers, they’re not good enough for us. I don’t just want to lower my heating bill, I want to Destroy it. My eventual goal for any house I settle down in for the long run is to make it require no fossil fuel energy to keep it warm all winter. To understand heating, you must first know what you’re paying for. Heat is often measured in BTUs, British Thermal Units. 100,000 BTUs is referred to as a “therm” on my Natural Gas bill, and a therm currently costs about $1.00. Then you must understand how you are losing your heat. The most important form of heat loss from your house is something called thermal transmittance, also known as U-factor. This is really just a number that means “how leaky is this material”, and it is based on the leakiness of a single pane of glass. A single-pane glass window has a U-factor of 1. In English units, this means that each square foot of glass leaks out one BTU of heat per hour, for each degree Fahrenheit your house is warmer than the outside air. So when you’re looking through a giant 10×10 foot window (100sqft), from a 70F room out into a 0F deadly-cold wintry blizzard, your window is leaking out 100 x 70 = 7,000 BTU per hour of heat into the night. That’s 7 cents per hour or $50.40 per month of heat from that single window. The “R-value” you have probably heard about is simply the inverse of the U factor. That means 1 divided by U equals R, and 1 divided by R equals U. You’ve heard of R-13 wall insulation, right? The U-factor of that is 1/13, or 0.08. With that knowledge, we can move up to understand the heat loss of an entire house. A 1000 square foot house probably has an outside surface area of about 2000 square feet including the roof. If it has standard R-13 wall insulation (and no windows for this example), and the temperature inside is 68F, it loses how much heat on a 32 degree day? 2000 square feet x 0.08 U-factor x 36 degree temperature difference = 5760 BTU per hour = $1.38 per day. “Hey, that’s a pretty cheap gas bill for a whole house in what sounds like a pretty cold climate”, you say. But wait, it gets even better. Imagine this household uses the same amount of electricity as me, about 299 kilowatt-hours per month, equivalent to 415 watts of average continuous use. How much heat does this electricity use add to the house? The answer is 1416 BTU per hour. “What? You were just talking about home heating, and now you are talking about electricity.. aren’t they two different things?”. No, it turns out they are actually directly related. Almost all of the electricity you use in your house ends up being converted to heat, with 100% efficiency. Your light bulbs give off heat and light, and the light bounces around the room and eventually gets absorbed by the walls and turns into a tiny amount of heat as well. Likewise for your appliances, your computer, etc. What this means is that any electricity you use in the heating season provides some of your heat, and reduces the amount your furnace needs to provide. The only exception to this rule is electric appliances that vent their waste heat outside, such as a clothes dryer or exterior lights. But we don’t use clothes dryers, right? So let’s go back to the 1000 square foot house. It needs 5760 BTU per hour to stay warm, and it gets 1416 of those BTUs just from the electricity you use while living there. So you’d still need the furnace to stay warm. But what if we increased the wall and roof insulation to R-53? That quadruples the insulation, which cuts the heat loss in four. And guess what – you have a self-heating house! Practical Example: the attic of this house is 1000 square feet. We want to quadruple the insulation from R-13 to R-53. To add the extra R-40, you’d simply have to blow in about 12 inches of cellulose insulation. This would take 61 bags of the stuff, which costs $610 before tax credits. Adding $610 of insulation to your attic is saving you about $15 per month of heat in this situation – $60 per year over a four-month heating season. It will also cut your air conditioner use. So it’s at least a 12% annual return on investment, forever. The self-heating house is the holy grail of home heating, and this is the way houses in many parts of the US could be built to destroy their winter heating bill. With proper design, the cost of the extra insulation would be small compared to the energy savings. Changes like this are really coming – the 2003 and 2007 international building codes, which most cities and towns adopted for all new construction, have much higher insulation standards, meaning lucky homebuyers in the future will have much lower costs. Now, my example was kind of silly, because the house was just a simple 25×40 rectangular box with no windows. What if we add windows? Good double-pane windows have a U-factor of about 0.3. If the sample house has eight 3×5 windows (a total of 120 square feet of glass), this adds a heat loss of about 1296 BTU per hour. D’oh! There goes almost all of the free heat we get from our electricity! How can we recover? Luckily the windows come with some good news too. Solar gain at work in MMM’s room. Shutters open in day, closed at night. Let’s say the smart designers of this house put two thirds of the windows on the South side of the house. The sun shines an average of five hours per day in this region, delivering 1000 watts per square meter (90 watts per square foot) mostly onto the side of the house. The windows let a certain amount of this heat into the house, based on their solar heat gain coefficient, which is usually around 0.3, or 30%. There are 80 square feet of glass on the South side, getting hit with 90 watts per square foot of light, and 30% of the heat makes it into the house. This is 2160 watts of heat for five hours, or 36,850 BTU of heat per day shining in. Averaging this over the 24 hours of a day, your house now has an extra 1535 BTU per hour of heat coming in, just from the South-facing windows. The lesson is: having 2/3 of the windows facing the Sun more than made up for all of the house’s total heat loss through all of its windows! Rule of Thumb: Each 3×5 window facing South gives you about $2 per month of free heat (in a moderately sunny climate). 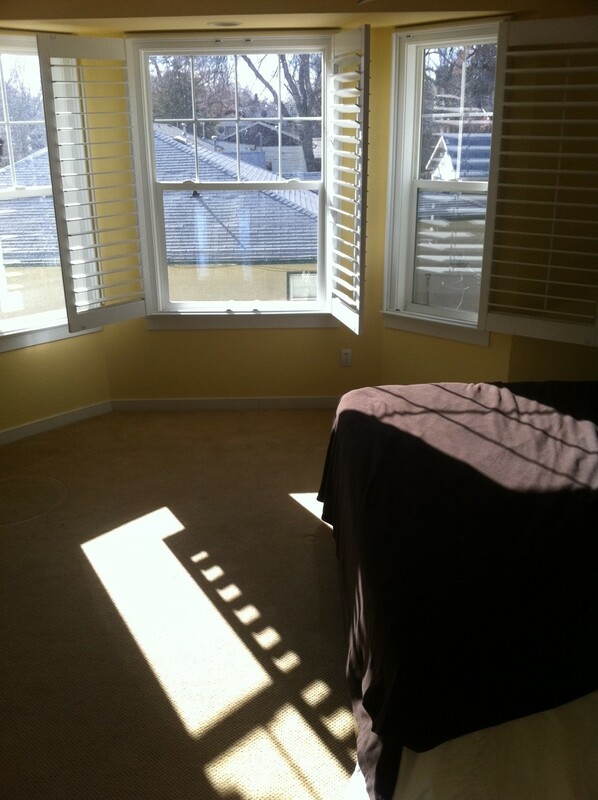 You can drastically improve the performance of your windows by using shutters or curtains on them. Open them when it is sunny, and close them at night and even on cloudy days if you wish. A tight-fitting curtain or honeycomb blind, or better yet a set of interior shutters, can cut heat loss through the windows in half again. Just remember to open them back up when the sun is shining in the window. The final easy thing under your control is the interior temperature. As we’ve seen above, the heat loss from your house depends entirely on the difference between the interior and exterior temperature. Supposed that I lived in San Francisco, where the average winter temperature (day averaged with night) is a moderate 50 degrees Fahrenheit. If I keep my house at 50, I will need to add absolutely no heat to it to keep warm. If you keep your house at 70, you will need some heat, and if someone between us likes 60 degrees, she will use exactly half of the amount of heat you use. So when you drop your interior temperature, it saves you some cash. Even if you just let it fall for a few hours while you go out for a walk or while you’re at work, it still saves heat because you are lowering the average difference between interior and exterior temperature. In my climate in January, the day/night temperature averages to 30 degrees. If an average person keeps his house at 72F (a 42 degree difference), and I keep mine at 67F (a 37 degree difference), my gas bill will be about 12 percent lower than his. If I further lower my average by dropping the temperature at night to 60F, I can save an additional 8%. Lesson: Running your house at 67F during the day and 60F at night will save you about 20% on your gas bill compared to a house that runs at 72F around the clock. So we have covered the big three: insulation, solar gain and window loss, and interior temperature. With the right combination of these three things, and enough thermal mass to keep your temperature nice and constant, you can have a self-heating house. The MMM family house is not a trivial one to heat, so it has no yet attained this status, but I am getting there. It’s about 2600 square feet in size, with 1800 of that above the ground. There are about 30 exterior windows and doors, some of them pretty big, and they are not (yet) all that well optimized for capturing solar heat. And most significantly, it houses a lady of Indian descent and a young boy, who both become quite unhappy if the interior temperature drops below 67 degrees Fahrenheit (19.5 Celsius) during the day. Solar collector on the roof for domestic hot water and radiant solar heat: $50. That cuts the bill down in half again to $200 per year. But after that, I’m out of ideas. Our current house is not an energy-efficient design to begin with, so it is difficult to get it fully self-heating. More changes could be made, but they would become more exotic and thus cost more than they delivered in savings. A future home of ours someday, however, will learn from the limitations of this one and have natural heat built in right from the drawing board. Perhaps yours will too! Update: This article was written way back in 2011. A couple years later, we moved to a “new” house (actually a 1959 house which I bought then rebuilt nearly from scratch). It is a smaller place with a much better orientation to the sun, and I used all of the principles in this article. As a result, it is much closer to optimal, getting nearly all of its heat for free and requiring no cooling in summer. An dream come true for both engineers and nature lovers, since the view is all sunshine and trees from most rooms. Bonus Points: After I skimmed the surface with this article, the readers posted a bunch more useful energy-saving techniques in the comments below. Check them out for more learning, especially Brian M’s comment about sealing leaks in an older house. Air leaks are even more important (and cheaper to fix) than insulation, so if you still have any of these around, fix ’em. Hi Cherilyn, I’m glad to have a chance to correct this common myth! It is ALWAYS a savings to turn something down or off, even for a short time – whether it is an idling car, furnace, water heater, or air conditioner. This is because it allows your house to be cooler for a while, which reduces the heat loss through the walls during that time. Your net heating/cooling/whatever bill is always equal to the amount of heat that you transfer through the walls. Obviously, leaving it cooler for longer is even better, but trust me on this answer – it’s simply the way the physics of heat loss works. Technically, if you live in a warmer climate and only have a heat pump, in the coldest part of winter it IS probably more efficient to leave the heat at a consistent setting. It’s an unfortunate reality of most thermostats. If you leave your heat at 70 all day, your heat pump can maintain this temperature with relatively low energy usage. But if you drop it down to 64 at night, then kick it back up to 70 when you wake up, your heat pump is going to want to get it back up to 70 as soon as it can. Enter auxiliary heat. If you’re not running on propane or natural gas, this means electrical strip heating elements. These strips can use up to 20,000 watts of electricity in a 3 ton system. So those 7 hours of turning the thermostat down to 64 might be completely erased in the hour your heating system takes to bring it back up to 70. Some thermostats have a way of letting you tell them the degree differential that will kick in the auxiliary heat source. So, if you say 7 degrees, it will only kick in the electric strips if you’re trying to go from 63 to 70. Most thermostats have a 3 degree differential by default. There is one exception to yo-yoing the heat. That is if you have geothermal heating. Because of the electrical backup that is built into the system, turning the heat down and later, back up, will make the heating unit think the geothermal has failed, and will kick in the emergency all electric heating unit. Over 2 degree change will make this happen. This would cost you big bucks. 2. Had the power company do a air leak inspection. They found and insulated air leaks from a main wall to the un-insulated garage, sealed around heater vents, sealed furnace located in garage, etc. 7. Unplugged a fridge in the garage that wasn’t being used. 9. As a bonus the insulation company “accidentally” insulated the attic over the garage for free, so I added insulation to my garage door for less than $30. As a result I am now saving hundreds of dollars per year in utility bills that can now be invested instead of paid to the power company. Hi, the temp today was 27. We usually turn our thermostat to 65 at night. Upon waking I turned it up to 68. The heat was on from 7:30 am to 12! In order for it to bring the temp back up 3 degrees! Does this sound like something is wrong? Our windows all sealed. Sounds like your furnace is a little undersized for the heat load of the house – which could mean the furnace is small, or the house leaks a lot of heat. My 100k BTU furnace can raise the temperature of our 2600SF house about 6F per hour in conditions like that. It would probably be very worthwhile to get a home energy audit done at your place! You basically draw out a schematic of your home (or other building), its size, window placements, orientation, insulation, etc and it will provide you information back on energy consumption. So you can fairly easily model energy savings from changing different parts of your home. This software is used quite a bit by utility companies (I used to work at one) & “Home-Energy Audit” types of companies. Give it a try if you like – it could make for an interesting future post! One thing I didn’t see mentioned is duct insulation. So many of us have air conditioning and heating ducts running through our attic. Most homes being built these days in my area use “flex duct” in the attic, but the R-value of flex duct rarely exceeds 8.0. Since we’re upgrading the attic insulation to R-53, wouldn’t it make sense to upgrade the ductwork beyond R-8 as well? I think another cool thing are IR fireplaces. They’re electricity-run and are a GREAT investment if you have solar panels. Our house has them and we are very fortunate to have not paid a single dollar in electricity (other than the service fee they require) each month. This means we run our AC and most of our heating on solar energy. I know this isn’t the general population, but as companies are starting to offer homeowners free panels (do not know the details of this but have a friend who says it doesn’t cost them anything) it might be a worthwhile investment. If you don’t have solar panels, it may be cheaper to run them but not cleaner energy. I didn’t see anyone mention the concern for frozen pipes–something to worry about here in upstate NY. Anyone have thoughts–besides obvious ones– on keeping pipes from freezing, while also keeping the heating bill low? The past 2 months we had quite a few -15 degree Fahrenheit nights, and we kept the heat higher (65), and the cabinets open, due to a concern that the pipes might freeze, which seriously jacked up our heating bill. We have gas heat and old hot water radiators, which I find to be surprisingly efficient. However, the kitchen is a 1960s add-on, on the North side of the house. Considering how cold this year was, I will certainly be insulating the kitchen walls and replacing the leaky back door. (and, yes, punch myself in the face for not doing it sooner). Thanks for the blog, MMM. Good idea and those already exist – Levolor and the other blind companies make options like that. But because they’re currently a niche/luxury market item right now, outfitting just a few windows with active blinds would cost more than an entire year’s heating bill for me. Somebody needs to do a Kickstarter project for a frugal version (or a click-on accessory that will run normal blinds). Could we get an apartment version of energy saving ideas? Amazing blog! I stumbled upon it a few weeks ago and have been glued to it ever since. I’m currently studying civil engineering at your Alma Mater, McMaster University and this semester, two of the courses I’m taking are Economics and Building Sciences and your blog is extremely relevant to both. My question regarding this post would be how do you calculate the optimum temperature to drop your furnace down to without having it work overtime to catch up to your preferred temperature in the morning? Hey Lone – the only limit is your comfort level, there is no such thing as “overtime” for a furnace, unless you have it off for so long and in such cold weather that your house is unacceptably cold when you get up. The ultimate heat savings would in theory be turning off the furnace so that the house becomes to cool JUST as you hop into your warm bed. Then the temperature drops all night (furnace does not run at all). Then the furnace kicks on in the early morning such that it JUST reaches comfortable temperature as you peel back the blankets to get up. Also, you’d want to keep any exposed plumbing above 0 degrees celsius, so there is another constraint. But not many houses leak heat that quickly even in extremely cold climates. Here’s what we did in 2005. we live in a 1500 sq ft Craftsman bungalow built in 1929. It had no insulation. It was heated by floor furnaces, and AC was four good sized window units. So we used 90 tubes of caulk and 20 cans of foam to seal air leaks. Then we put 14 inches of cellulose insulation in the attic, and filled our walls with the same. Then we built new walls, 5 inches inside of our existing walls, and filled those with insulation, so we have 9 inches of insulation in our walls. We installed double pain argon filled low e tinted windows. We planted extensive vegetation outside that over the last ten years has grown up to shade the entire house in the summer. We took the brick wall off of our south facing utility room, and installed 120 sq feet of glass (using double pane standard patio doors and two double hung windows like we had installed elsewhere in the house. We disconnected from the natural gas grid and we buy wind generated electricity from our utility. We installed an electric water heater, with an on-off switch, which pretty much functions like an on-demand water heater except it was much much less expensive. If the tank has cooled to ambient, within 10 minutes after switching it on we get a stream of hot water at the kitchen faucet or bathroom shower. And yes, we have a 1.5 gallon/minute showerhead. We installed vents above all the doors in the house, so the warm air from the sunporch in the winter moves around the house by convection. We have a woodburning stove for backup when the sun isn’t shining. But it takes us a day if it is cold and rainy for example, if we have had several days of sun, before we feel like building a fire. We use only a half cord or so on average/year, depending on the cloud cover. We went four years without air conditioning, but the problem with that is that we couldn’t stay out of AC permanently. I was always most uncomfortable when I came home from my perfectly AC’d job. After a couple days off, it was much more comfortable. Our experience is that our passive measures and shade got us 10 degrees cooler inside the house than outside, at 4 PM on a hot August afternoon. We had ceiling and floor fans, and that got us another 10 degrees of comfort. So our passive measures + ventilation got us about 20 degrees effectively, which was nice. But nothing can take care of the humidity issue. That is less of a problem in Colorado, but in places like central Oklahoma, that’s a big deal. So after four years, we decided to add AC. I bought 3, 5K BTU window units. Each one should cool about 120 sq ft. We find that we almost never have all three going at once; generallys its only one or two at a time, and that keeps the whole 1500 sq ft house comfortable. Our theory is that they are mostly functioning as dehumidifiers. Awesome blog, I love it! Just found out about it through the New Yorker article, and now I’m binge-reading to catch up and try to learn the ropes of Mustachianism. I’m already scheming to get onto Amazon and buy water-saving showerheads and such (already optimized with LED and CFC lighting throughout the house for now). Back on topic with chopping heating bills: have you seen the heating duct-work wrap for heating ducts in one’s (cold) basement near the furnace? Do you or any readers have any input about the efficacy of this wrap, and whether one could expect a decent ROI over time? The ones I’ve seen in Home Depot and Lowes etc. seem a bit pricey and look to be a bit on the thin side, but if they work well (or a homemade alternative could be crafted more cheaply), it might be worth a shot. It’s basically about Michael Reynolds who has been building earth ships for 30 years. The houses he builds are self sufficient, including power, heat, sewage, etc. I know they might not be for everyone, but I’m sure the people who visit this blog would find it very interesting. Such a great article. Maybe you can consider to use darker floor for the southern windows to absorb more heat. We just bought a small 960 sq ft house a few months ago. Our attic has vermeculite insulation unfortunately and it seems like there isn’t any insulation in the walls – they are cold to the touch (and it isn’t even winter yet). All the windows are newer Pella brand. Our furnace/ac are over 20 years old, but still going strong! Any suggestions since we can’t do much with the vermeculite? When I was remodeling our 1904 homestead I pulled rolled up newspapers from between the board and bats. (That’s how I know the homestead was built in 1904.) I’ve used this method instead of spray foam to seal cracks around windows and such since. To seal the crack further, put a small bead of caulk on each side of the paper. Foam out gasses formaldehyde, which is an environmental health hazard. By sealing all of the air leaks one must be cognizant of any harmful elements within. Rolled up newspaper. Simple. We’ve lost more than our ancestors knew. That homestead was only 16′ by 24′. They raised a family in it. Down sizing is the ultimate answer. And, using whatever is available and free. So I’ve been tweaking the indoor temps, raising them a little every few days, and yesterday my 16 year old comes downstairs saying she is “freezing” in her room, wearing a sweatshirt. It’s warmer in there today than it has been in YEARS! I hope she gets colder as the thermostat creeps higher!